Seating is super limited! Register now! Prices start at $329* and increase $10 every Saturday from April 30 - June 8. *All materials and snacks/drinks are included! Kids bring lunch and may also bring their favorite fabrics to make a creation of their own design! Our focus is teaching YOU to sew! What do we offer? Sewing classes for adults! Beginner to Intermediate skill levels. Kids beginner and intermediate classes. School break CAMPS. 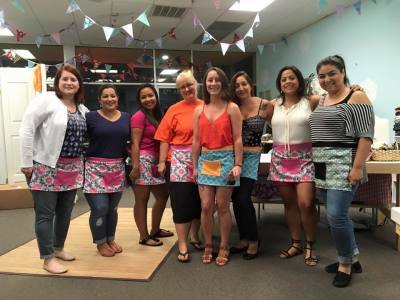 Adult & Kids' parties, baby showers, bridal showers, and more! 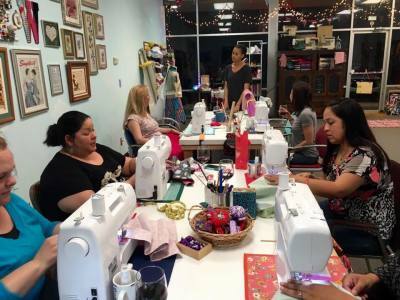 Adult Sewing Boot Camps-- 6 weeks of AWESOME! These classes are for homeschooled kiddos age 8 and up! All projects are designed for beginner sewists in mind. 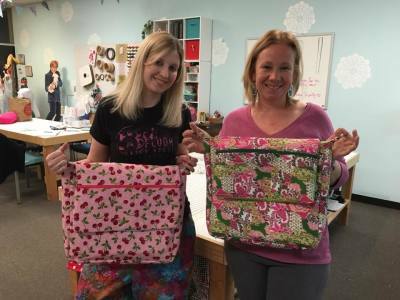 My daughter and I had the pleasure of taking a Mommy and Me sewing class with Abby's Attic. What a special experience for us - we were able to learn a new skill (neither of us had ever touched a sewing machine! ), spend time together, and to top it off, we left with pajama pants that we could actually wear! Jen was patient, kind, and detailed with her instruction with both my daughter and me as we discovered the joy of sewing. 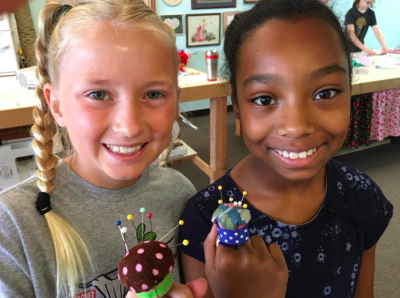 We couldn't recommend Abby's Attic more and look forward to our next class!-- Jennifer D., and daughter, age 9.
old shirts away and I'm so glad I didn't. Her t-shirt quilt turned out so amazing and was a great way to preserve her Elementary School memories. Jen is incredibly patient and very knowledgeable, a great teacher! Frankly, my sewing machine was intimidating to me, but working with Jen gave me confidence to tackle other projects at home! -- Andrea H., and daughter, age 11. I was so pleased with your help and instructions. You were so knowledgeable about my machine that I left thinking I was ready to start sewing. I will definitely be back to learn new techniques. -- Rita T.
This was such a great alternative to the traditional birthday party ideas! The had so much fun learning a skill they'll be able to use for the rest of their lives. Jennifer was so patient and helpful with all the girls. We'll definitely have another sewing party there again. We look forward to attending classes during the summer, too! --Jennifer F.
Just took my very first beginner's class and took my new sewing machine out of the box since I received for a gift over 2 years ago! I had so much FUN and can't wait to go again! Jennifer was so sweet, patient, and fun! Her studio us so cute! This was EXACTLY what I needed! 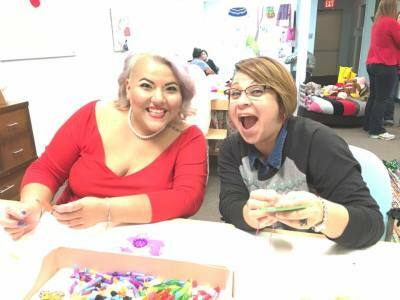 -- Kristy W.
Abby’s Attic is a sewing school that is helping keep alive the crafts of sewing and handmade arts. Jennifer would like to stay relevant and serve the needs of the community. 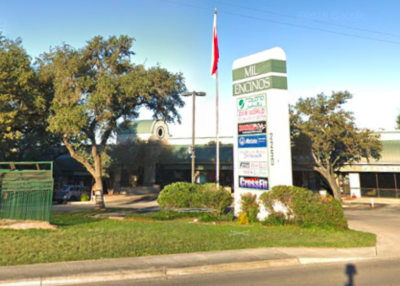 We know that homeschooling is common in San Antonio and classes that meet the needs of the homeschool community are a bonus. Abby’s Attic is interested in offering a sewing class for homeschool students that would fit your needs and schedule. Jennifer has access to sewing curriculums that can be tailored to fit the needs of the students in the class. Please contact her if you are interested in a homeschool sewing class and let her know what would work for you. Even if this doesn’t interest you, please help support small businesses and post this info on any homeschool group pages or any mom pages that you frequent to help give the studio exposure. The studio is well designed and laid out perfectly for all the aspects critical to learn to sew. 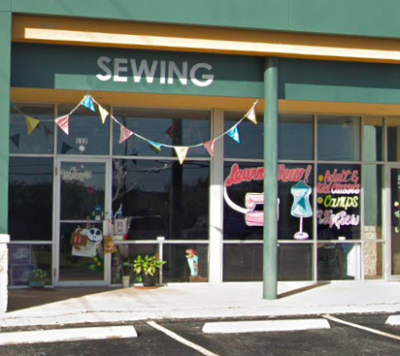 The studio provides sewing machines, scissors, thread, and many supplies for most of its classes. 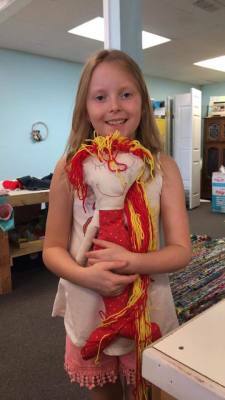 My 10 year old attended Abby’s Attic Summer Camp and my 8 year old had her first sewing lesson recently with Jennifer. Jennifer is very patient, as proven by working with my girls. -- Sarah S.
This was my first time my 11 year old touched a sewing machine and my first time getting "real" lessons. It was an awesome experience. My daughter had a great time; the instructor was so patient and moved at a pace suitable for every student. We will definitely be taking more classes!! -- Katrina P.
My 12 year old daughter took the full day camp and LOVED IT! She can't wait to go back to learn more! Thank you for helping her interest in sewing grow! -- Nicole Z. Had a fantastic time making my tote bag!! Definitely interested in semi-private lessons. -- Sonia G.
I could do this every weekend. This was fun and I learned a lot! -- Becky T.
Great sewing school! The earlier you sign up, the better the price. I signed up my 13 year old daughter for a sewing camp and the dates further out were less expensive. It was well worth the cost, especially how happy and confident my daughter came home feeling each day. She has made many cute projects. We will definitely be back! -- Rachel M.